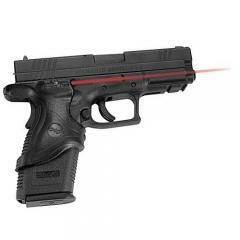 Crimson Trace LG-445 Laser Grips for Springfield Armory XD .45 ACP FREE SHIPPING! Hit the mark anytime, anywhere with the Laser Grip for Springfield Armory XD .45 ACP from Crimson Trace. Designed to deliver improved shot accuracy without affecting the handling or weight of .45 ACP caliber pistols, the sight features the latest in innovative laser technology. A compact design utilizing micro-circuits hugs the pistol's handle for a natural fit that does not affect holstering or quickdraw capabilities. The instinctive front activation switch allows for near instant target acquisition immediately upon drawing the weapon without any adjustments to grip or hand positioning. The laser is factory sighted at 50-feet for up to four hours of use, guaranteeing maximum accuracy directly out of the box. Note: This model is not compatible with XDM series or ambidextrous safety versions. ©2002-2019 CopsPlus.com: Crimson Trace LG-445 Laser Grips for Springfield Armory XD .45 ACP FREE SHIPPING!